According to astronomers working on the Hubble Space Telescope, a supernova will be visible in the sky in the first few months of 2016. The prediction is possible because astronomers first saw the star explode in 2014 in a gravitationally lensed galaxy, which will also make it observable again next year. Gravitational lenses occur when an enormous object (or objects such as a huge cluster of galaxies) enlarges and distorts the light of background galaxies. In this scenario, the galaxy cluster is so huge that it distorts space and time so that it acts like a huge magnifying glass. Occasionally, these distortions yield numerous images of the same object. Though they belong to the similar galaxy, the pictures we see were not produced at the same time. Since light travels at a finite speed, photons will take quite a different amount of time to travel around the massive object dependent on the track they follow – with some paths taking quite a bit longer than others. The supernova detonation that we will see in 2016 is a re-run of the 2014 one, recognized as the Refsdal Supernova. It was produced in a galaxy nine billion light-years away, and the lens is formed by a huge galaxy cluster, titled MACS J1149+2223, five billion light-years from us. When the object was first revealed, astronomers saw the supernova nearly four times, as one of the pictures was impeccably ranged with an elliptical galaxy in the cluster, creating an extra lensing boost. 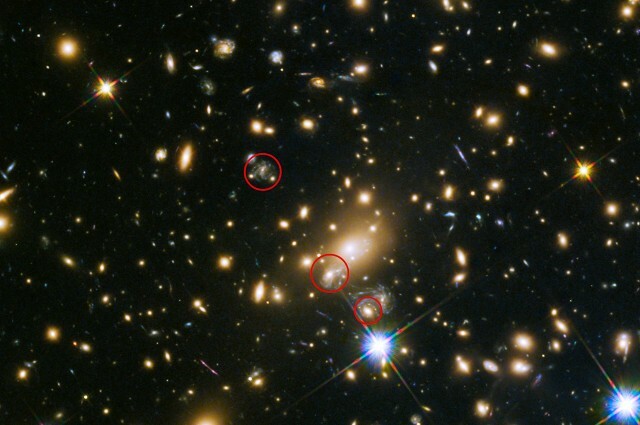 By reviewing the matter circulation in the cluster, astronomers were able to forecast that some of the photons produced by the supernova are still traveling and are yet to reach at Earth. For this cause, Hubble will now from time to time stare at the lensed galaxy in the hope of identifying the star going off.